An undated picture, taken before the fall of Moammar Gadhafi's regime, shows a general view of an oil and gas field in Tripoli. How soon can Libya get its oil to flow? With former Libyan leader Moammar Gadhafi ousted and dead, Libya’s interim government seems confident the country can reach pre-war oil production levels soon. But not everyone is so optimistic. Before the February uprising, Libya put out about 1.6 million barrels of oil each day. That’s 2% of the world’s daily oil production. The oil stopped flowing during the civil war as foreign companies left without properly shutting down the oil infrastructure. It is estimated Libya is now producing about 350,000 barrels of oil per day, but Libya’s new leaders are anxious to get more oil flowing. Some oil companies that operated wells and refineries in Libya before the war “expressed some skepticism regarding a restoration of production to full pre-war levels within the next six months,” according to Fadel Gheit, managing director of oil and gas research at the Oppenheimer & Co. investment bank and firm. 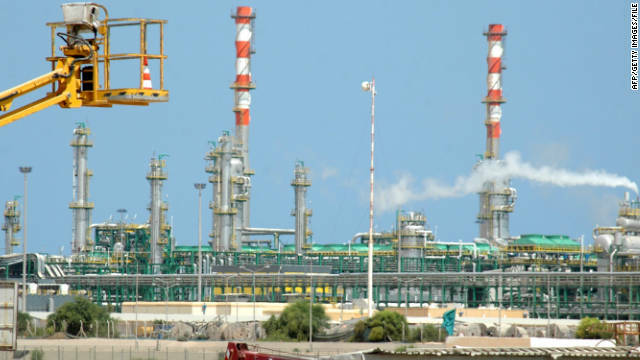 Gheit said because European oil companies left Libya so quickly during the uprising, they didn’t place the drills and refineries in a state that would make them easy to start up again. In some cases, wells will have to be re-drilled. The new leaders of Libya will have to invest in the dilapidated oil infrastructure to maximize production and increase the nation’s revenue. But their limited funds are also needed to rebuild the country in the wake of intense fighting. If they spend too much on one, they may not be able to get the other done. Researchers in Hawaii who predicted that a wave of debris from Japan’s March 11 tsunami may hit Hawaiian shores by 2013 are preparing studies that may allow more precise forecasts. The preparations come a month after a Russian ship found “unmistakable tsunami debris” - including a refrigerator, a TV and a damaged 20-foot fishing vessel - in the Pacific Ocean between Japan and the Midway Atoll, according to the International Pacific Research Center of the University of Hawaii at Manoa. The fishing boat had markings that indicated it came from Japan’s Fukushima Prefecture, the university said. Maximenko and fellow researcher Jan Hafner predicted in April - using computer models developed from observations of how buoys drift in the ocean - that some of the debris that the tsunami carried away would reach the Hawaiian islands by 2013. Some debris would then hit the western U.S. and Canadian coasts by 2014 before bouncing back toward Hawaii for a second impact. They also predict that some of the smaller, lighter debris such as plastic bottles could reach the Midway Atoll, more than 1,200 miles northwest of Hawaii, by this winter. This year, students from Ohio University decided to take a stand against dressing up as racial stereotypes for Halloween, or at least open a discussion about the unsavory costumes. Mission accomplished. The story about their campaign certainly sparked a response from CNN.com readers, nearly all of whom said the students were taking themselves too seriously. CaptainJack1 said, “I am deeply offended when anyone goes out dressed as a pirate. I ask that everyone remember that we have feelings too and want to be treated with respect. Thank you." Is adulation promoting a sort of sainthood for Jobs? CNN asked four experts on religion and technology to weigh in on whether former Apple chief Steve Jobs is achieving a kind of secular sainthood. Their collective answer: yes and no. But most CNN.com readers said that while they appreciate Jobs' contributions to society, they don’t view him as a saint. Jim said, “Jobs was a technology visionary. THAT cannot be disputed. He was a valuable man to the advancement of technology, but fallible and certainly no saint." james mcneil said, “The more we learned about Steve Jobs the more we see him as an ordinary man, very ordinary. 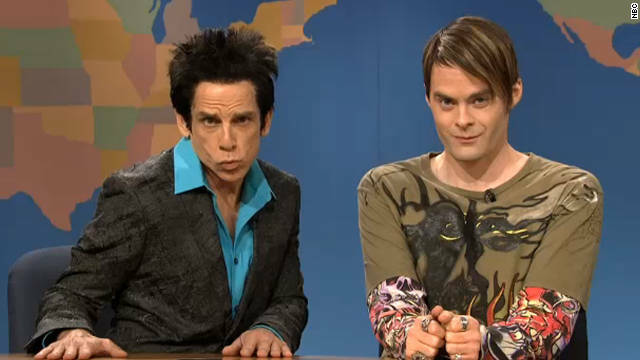 Sure, he is absolutely technologically talented, but as a human being he is rather questionable. Did Steve Jobs love anyone in his life, truly love – God, his adopted parents, his biological parents, his children, his friends and colleagues? Perhaps, his work!" Samantha said, “The man is dead, why are we asking this question? He may not be a saint, but is that really what we are focusing on here? We are missing the point of death and the person. Let's remember him for who he was and let others write what they want. No judging who the man was because there should be no judgment now." MattmarkLukeJohn said, “Jobs is beyond sainthood; He is the Savior. Steve Jobs gave his life so the world could have iPhones." Do you feel your views align with these commenters' thoughts? Post a comment below, or sound off on video. 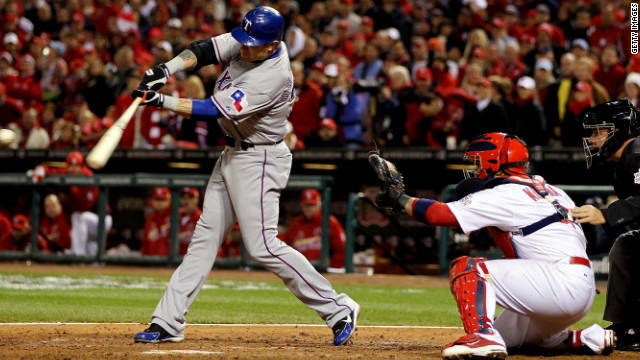 Outfielder Josh Hamilton (shown batting) and his Rangers teammates will wait until Thursday for a chance to clinch the title. Major League Baseball has moved Game 6 of the World Series from Wednesday to Thursday, citing "inclement weather and the forecast for rainfall throughout the remainder of the day" in St. Louis. The game between the Texas Rangers and host St. Louis Cardinals will be played at 7:05 p.m. CT Thursday, MLB said. "Given the desire to play a game of this magnitude without interruption, and an outlook with better conditions over the next two nights, Major League Baseball, along with the Cardinals and the Rangers, determined that making the decision early would be the most prudent course of action to allow fans enough time to plan accordingly," Major League Baseball said in a statement. The Rangers need one more win to take the Commissioner's Trophy and end the Cardinals' improbable championship run. The Rangers, who were runners-up to San Francisco in last year's championship series, hold a 3-2 lead, leaving the Cardinals with the daunting task of having to sweep the last two games to be champs. [Updated at 2:12 p.m. ET] One person was killed and at least five others wounded in a bomb blast late Wednesday while two more improvised explosives were detonated in a village near the southern Philippine port city of Zamboanga, officials said. Senior Superintendent Edwin de Ocampo, chief of the local police force, said two bombs planted at a lottery outlet and at another site about 100 meters away were discovered. Police were in the process of detonating two of the bombs when the third device went off hitting a roadside eatery in the village of Sangali at around 9:15 p.m., about 30 kilometers east of downtown Zamboanga. De Ocampo said the three improvised explosives were planted almost 100 meters apart from each other. He said the fatality, a civilian, was killed when he tinkered with the third improvised bomb as policemen were detonating the two other explosives. "The civilian was killed on the spot by the powerful blast," he said. Police had initially said two people had died in the blast but later revised the total to one dead. [Posted at 12:37 a.m. ET] Two people were killed and at least five others wounded in a bomb blast late Wednesday in the southern Philippine port city of Zamboanga, officials said. Two more improvised explosives were detonated nearby, officials said. CNN contributor William Bennett says President Obama's decision to withdraw troops from Iraq will probably lead to disaster. William J. Bennett, a CNN contributor, author, former U.S. secretary of education and former director of the Office of National Drug Control Policy, says President Obama is making a mistake by withdrawing nearly all troops from Iraq. 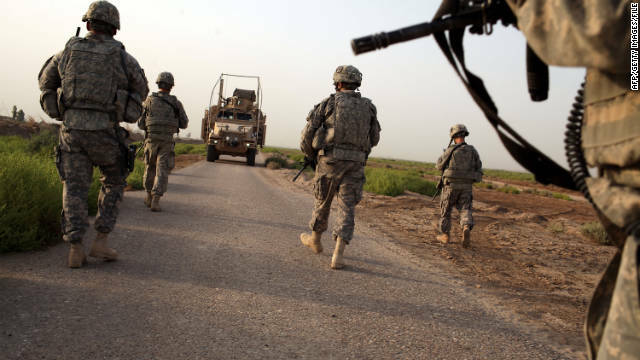 Suggesting that the president’s decision is politically motivated, he points to U.S. generals’ wishes to have at least 15,000 troops remain in the country. But CNN.com readers overwhelmingly disagreed with Bennett. Most readers said that withdrawal is long overdue and that attempting to block Iranian influence seems to be putting off the inevitable. Based on readers' feedback, it’s clear that Americans are ready for the troops in Iraq to come home. Moorbo responded, “I would add that this is another Republican that will cheer cutting welfare programs for U.S. citizens in the name of fiscal responsibility, but get upset about cutting this massive portion of our budget for this war that is providing security for people who are not U.S. citizens. After 17 days of hearing about how pop star Michael Jackson died under Dr. Conrad Murray's care, jurors began hearing Wednesday from people who say the doctor saved lives. "He's the best doctor I've ever been to," said Gerry Causey, a 68-year-old former patient of the man accused of causing Jackson's death. The defense will call five witnesses Wednesday to testify about Murray's character as testimony in the doctor's involuntary manslaughter trial nears an end. "And I just don't think he did what he's being accused of," Causey said under cross-examination by the prosecution. Much of the prosecution's case has tried to demonstrate that Murray gave reckless and incompetent medical treatment as Jackson's personal doctor in the last months of his life. Causey met Murray 11 years ago when he was rushed to a Las Vegas hospital with a heart attack, but they' became friends since then, he testified. "It's because of Dr. Murray, the way he cares for you, the way he makes you feel," Causey said. Prosecutors contend that Murray abandoned his patients in Las Vegas and Houston, Texas, for the $150,000 a month Jackson had promised him. "There's no way, he's not greedy," Causey said. "He doesn't charge me my deductable, never has." As the countdown clock to the date keeps ticking, and people keep buzzing about the number, many are trying to figure out the real importance of hitting that marker. The Wall Street Journal proposed the question: "How Do You Get to 7 Billion People?" The article raised the question: Exactly how do you know that we are reaching this symbolic number on a date set by the United Nations, given that some countries don't have full census data? 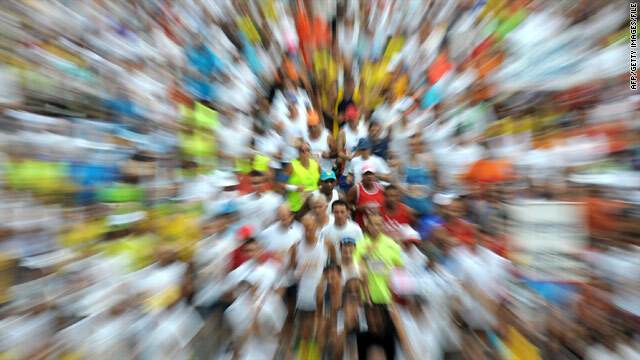 "The world's population will hit seven billion on Oct. 31. Or maybe not until next year. Or maybe it has already happened. "No one knows for sure. But that hasn't stopped the United Nations from picking the last day of the month as the symbolic date, christening it as 7 Billion Day." "While seven billion is a nice round number, knowing the identity of the lucky baby or the exact moment the threshold is crossed isn't really any more important than pulling over to the side of the road to bask in your car's 100,000th mile. But the building blocks for world population estimates — national demographic statistics and characteristics — are used by governments, businesses and aid groups to plan spending and spot potential trouble spots." In a growing and ever-changing economic and technological world, this may be the time to look at where we've been, what we're going through now and what challenges lie ahead for such a massive population. Singer Amy Winehouse's death this summer was the result of alcohol poisoning, an inquest ruled Wednesday, as it reached a verdict of "death by misadventure." A pathologist told a coroner's court in north London that alcohol toxicity was the cause of the 27-year-old's death, with her blood-alcohol levels measured at more than five times the legal limit for driving. The Grammy award-winning artist, who had battled with alcohol and drug abuse over several years, was found dead at her north London home July 23. Testimony at her inquest showed no traces of illegal drugs in Winehouse's system - but more details emerged about her losing battle with alcohol. Winehouse's physician, Dr. Christina Romete, said she saw Winehouse at 7 p.m. the day before she died, when the singer was tipsy but still able to hold a conversation. Asked when she was going to stop drinking, Winehouse replied that she would call Romete over the weekend to discuss it, the physician said. Winehouse was determined to do things her own way, including therapy, Romete said, but was aware of the risks of alcohol abuse. 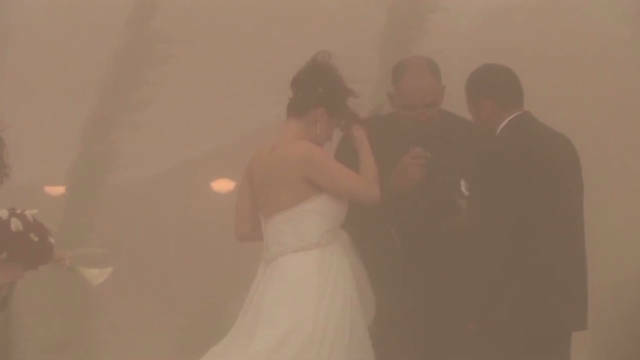 A couple in Arizona exchange vows as a dust storm rolls in. There is no doubt that planning a wedding takes a lot of time and effort. You've got to make your guest list, hire a caterer, get flowers and decorations, order the cake, the list just goes on and on. That said, a lot can definitely go wrong at a wedding, and sometimes you can't do a darn thing about it. How about getting married in a dust storm for instance? Today's gotta watch is all about wedding disasters, and the video topping our favorites list involves a bride, a groom and an unwelcome guest named "Haboob." Really dirty wedding crasher - A couple in Arizona got more than they bargained for when they tried to say their "I Dos." You've really gotta watch what happened when a major dust storm rolled in during the middle of the ceremony. Yemeni women defiantly burned their traditional veils Wednesday in protest of President Ali Abdullah Saleh's brutal crackdown on anti-government demonstrations. Thousands of women gathered in the capital, Sanaa, said witnesses. They carried banners that read: "Saleh the butcher is killing women and is proud of it" and "Women have no value in the eyes in Ali Saleh." They collected veils and scarves in a huge pile and set it ablaze in an act that is highly symbolic in the conservative Islamic nation. More than 60 women were attacked in October alone by the government, said protester Ruqaiah Nasser. Government forces are raiding homes and also killing children, she said. "We will not stay quiet and will defend ourselves if our men can't defend us," she said. " The world is days away from officially reaching a population of 7 billion, the United Nations said in a report Wednesday. The milestone, to be declared on October 31, is a huge spike from less than a century ago. In 1927, the global population was only 2 billion. Only 13 years ago, the population was at 6 billion, the U.N. says. While reaching 7 billion in 2011 has long been predicted, the new U.N. report Wednesday - "State of World Population 2011" - looks at challenges and opportunities coming from the dramatic growth. CNN.com Live is your home for gavel-to-gavel coverage of Dr. Conrad Murray's involuntary manslaughter trial. 10:00 am ET - Alleged Iran terror plot hearing - Two House homeland security subcommittees convene to discuss the alleged plot to kill the Saudi ambassador to the U.S.
Twin grenade attacks in Nairobi earlier this week were not the work of the Somali militant group Al-Shabaab, a Kenyan government spokesman said Wednesday. "It was two young guys inspired by Al-Shabaab," said Alfred Mutua, "but not directed by Al-Shabaab leadership." One suspect has been arrested, Mutua said, and authorities hope to arrest the second soon. Authorities made a series of arrests at Occupy Wall Street protests in California and Georgia on Tuesday with clashes in one city that involved tear gas being used on demonstrators. Police said they fired the tear gas on protesters in Oakland, California, after the crowd threw paint and other objects at officers. The crowd of about 500 people defied calls to leave an area of downtown Oakland on Tuesday, according to police. Protesters had camped for weeks in several areas in the city, including near City Hall, police said. "The city remains committed to respecting free speech as well as maintaining the city's responsibility to protect public health and safety," Oakland police said in a statement. Police arrested demonstrators at Woodruff Park in downtown Atlanta overnight. The arrests came after Atlanta Mayor Kasim Reed said he sent ministers to the park "to see if we can find a way to resolve this amicably." A protester at the park said he was scared. "It's very intimidating," said Malcolm McKenzie. "I believe what we're doing is right, but we're going to jail. It hurts to see America do this to people who want change." It was unclear how many people were arrested in both cities. CNN affiliate KGO reported that at least 85 people were arrested during an early morning raid in one part of Oakland and there were other arrests throughout the day. In that raid early Tuesday, police dismantled a tent camp set up by protesters in a city park. The overnight camping had to end because of health and safety concerns, Oakland police said in a statement.